Reykjavik Daybed is inspired by the distinctive architecture on Iceland. Imitating the shapes and reflections of the characteristic wooden constructions and corrugated steel roofs of the capital city. 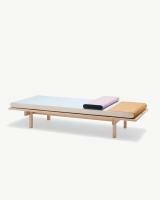 The bed frame is made from solid wooden planks from Dinesen of the wood type called German Douglas Pine. You can change the colour balance of the woollen upholstery by flipping over the mattress. The pillow comes in two colors as well and can be placed differently on the daybed as you see fit.